Attention skiers: climate change means fewer trips to Tahoe this century. That’s the word from a first-time study by the Department of the Interior. Less snow also means additional challenges for storing water during drier months. According to the DOI's Sacramento and San Joaquin Basins Climate Impact Assessment, the average temperature in California’s Central Valley is predicted to rise by about 3 degrees Fahrenheit by mid-century and possibly more than 5 degrees by the end of the century. It may not sound like much, but it means more rain and less snow in the Sierra. That snow provides more than recreation for skiers. It’s like a bank account for future water withdrawals. 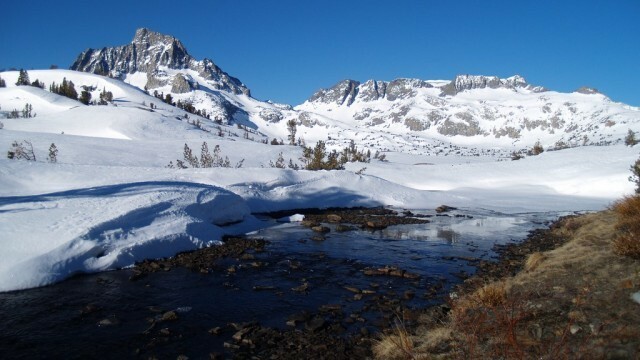 Deputy Interior Secretary Michael Connor says we've historically relied on the natural snowpack to melt slowly, providing steady runoff that would provide water for cities and farms into mid-to-late summer. Less snow means less water during California's hotter, drier months. "This study confirms that the current status quo for water supply in California is not sustainable," said Connor. The challenge is how to capture the early rain. Connor says there are two options: construct more reservoirs or try to replenish groundwater (usually done by flooding low-lying areas and allowing the water to percolate into the ground). Environmentalists oppose new dams and the federal government doesn't regulate withdrawals from aquifers. Neither did California until just recently. Last week Gov. Jerry Brown signed a package of bills that put the state on the road to coordinated management of groundwater -- but it's a long road. It will take years to implement the new system. Ron Stork of the environmental advocacy group Friends of the River, says farmers in large parts of the San Joaquin Valley have been "mining groundwater for years." Ultimately, Stork says, it will mean a reduction in the number of farmed acres in the Central Valley. "The average annual agricultural demands are projected to decrease because of reduced irrigated acreage." "In the northern part of the Sacramento Valley, projections indicate a slight increase of a few percent in precipitation around the mid-century period. A slight decrease in precipitation was projected to occur in both the San Joaquin and Tulare Lake basins. In these basins, the reductions tend to increase throughout the 21st century from a few percent to nearly 10 percent in the southern parts of the Central Valley." Scientists agree that the timing of that precipitation and the form in which it falls -- rain v. snow -- may matter more than the actual changes in volume.